No dyno for me, just a long reach to the lip. Yks nemesis taas kaadettu. Aika monta vuotta tuli hiukka yrkkäiltyä ja menihän se viimein. Tamperelaisittain eliminoitu, mutta onhan sitä hienoja muuveja tässäkin! Nice and weird roof moves to font style sloper top-out. 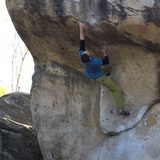 From a knife sharp first move to an enjoyable edge slapping traverse. Second go kintun lipsautuksen jälkeen. Lienee reilusti helpompi. Might be a bit morfo. Felt hard two years ago. Now went on second go! Awesome line! Nyt on helemee! Tässä on kyllä kaikki palaset loksahtanu kohalleen! Easy start, brutal after that. Taisi siinä nelisen vuotta ja muutama sessari vierähtää ennenku tää meni. Hienohan sen on myönnettävä olevan! Olipas se muuten saakelin makee tämäkin! Hiukkasen pehmonen ehkä greidiinsä. Johan oli paini! Tuli Fontsuki mieleen matkalla. Hieno! Istumalähtö ei tuntunut muuttavan greidiä. Extra nice line with weirdly different moves! Awesome moves! Nice one Anton! Parit däpit joutuu otetaan ennekuin meni, hauska! One of the hardest 6B's I've ever done, but thats the font style. Technical climbing with slippery feet. Classic! Nice route with highis ending! Tääkin oli makee reitti, ehkä jopa kiven makein! Nice! Clear line with powerful moves! 3D climbing with scary top! Ss ads a nice spice to it, but not more difficulty. Aika pitkä vääntö enneku portsari päästi sisään. Olipas kyllä hieno! Toppikuumotus bonuksena. Rainy day under training. Nice moves! Ilman oikeenpuolimmaista kivee oli aika napakka! 3rd go. When comparing this to murtomaa it isn't quite that hard. Nice line still! Wow! A lot more technical than I originally thought. Nice one! But dont think that the sit start actually changes the grade that much. Even the stand felt like 6C. Fyysinen kruksi alussa ja henkinen ehdottomasti lopussa. Kyllä muuten kuumotti! Kai tää on sitte tooooodella old school 5+? First go of the second session. Undervalued version of the Martikainen family. Actually quite nice! Weird not that all dynamic dyno! Made it with dyno, but this can also be done staticly and the grade for that would be 6C maybe. Weird lay down mantel start to committed jump. Nice one even though it has the eliminate. Hand to learn some jamming action to make the topout. Nice jump with a weird swing to hold! Pretty tough for the grade but nice moves. Nice moves with fairly big holds. Went on second session. Epic battle, with countless tries! Nice variety of different moves to highis topout! Took quite a few sessions to work this out. Might look easy, but it might surprise you. Nice one including some delegate and technical footwork! on same tracks with Mikko. Still a pretty nice line! Nice, but maybe a bit soft. Managed to send it after quite of a strugle with the sloper. One session. With hook beta. Nice variety of different holds. Good one! Took a few tries. Nice route! To the left i say! Nice route! Might be a bit soft though.